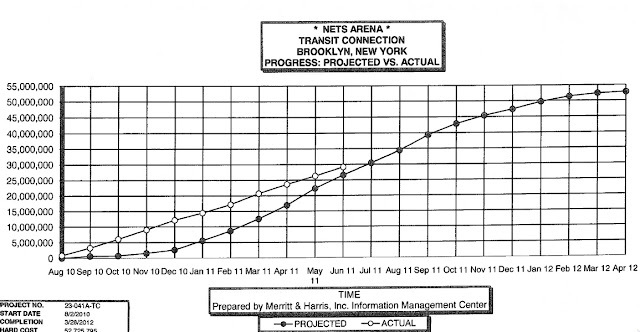 According to the latest Arena Site Observation Report, dated 8/5/11 and based on a 6/23/11 visit and documents made available 7/25/11, the Barclays Center remains one month ahead of schedule and the transit connection remains two months ahead of schedule. 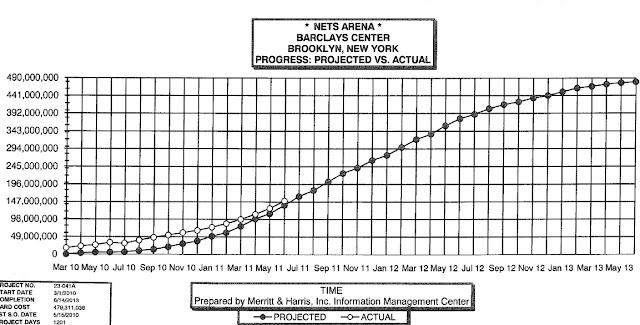 The estimate, based on cash flow, comes in a report prepared by Merritt & Harris, the real estate consultant to the arena PILOT Bond Trustee. As I wrote 7/22/11 regarding the previous report, some items should provoke further inquiry, such as a discrepancy between the number of workers reported and the number reported by Forest City Ratner. Also, there may be a lingering dispute about the schedule. Given that Merritt & Harris reviewed documents in July, I assume that number is from July. There may be an explanation for those numbers--workers beyond the arena and infrastructure? Such discrepancies might be explained by a report from the Independent Compliance Monitor (ICM) required by the Community Benefits Agreement, but no ICM has been hired. Forest City last month said that 17% of the work on the arena and transit connection was attributable to MWBE companies, not 15.5%. The graphic below indicates arena construction progress--a month ahead of schedule according to the text, though that's not precisely indicated by the graphic. Still, they're only about one-third done, with some significant work left to go--which may be why there's now so much after-hours work. The graphic below indicates transit connection construction progress--two months ahead of schedule according to the text, though, again, the graphic does quite reflect that. For months, Merritt & Harris has hinted at some unresolved, if not necessarily highly contentious, discrepancies over the schedule, with a resolution "expected" soon but instead continually put off. The original High Level Arena Summary Construction Schedule, dated July 16, 2010, had been provided for our review. We subsequently received the Executive Level Summary for Schedule 12M, dated February 10, 2011, prepared by Hunt, which indicates that substantial completion is anticipated to be by August 27, 2012. The Developer is currently reviewing that schedule and is working with Hunt to reach an agreement. A resolution is expected by August 2011. The original High Level Arena Summary Construction Schedule, dated July 16, 2010, had been provided for our review. We subsequently received the Executive Level Summary for Schedule 12M, dated February 10, 2011, prepared by Hunt, which indicates that substantial completion is anticipated to be by August 27, 2012. The Developer is currently reviewing that schedule and is working with Hunt to reach an agreement. A resolution is expected by July 2011. 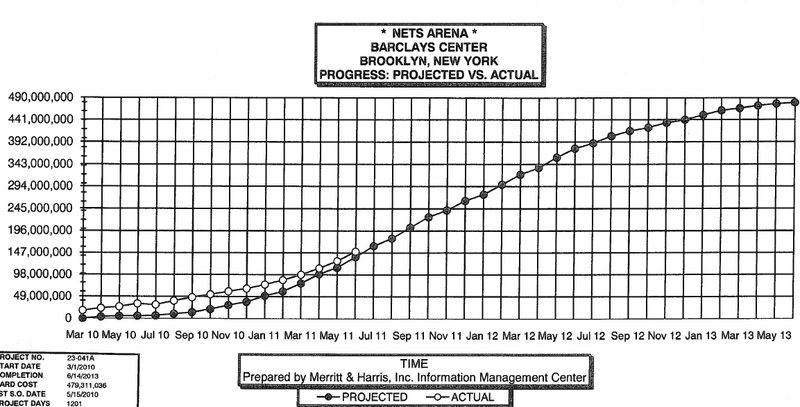 The original High Level Arena Summary Construction Schedule, dated July 16, 2010, had been provided for our review. We have now received the Executive Level Summary for Schedule 12M, dated February 10, 2011, prepared by Hunt, which indicates that substantial completion is anticipated to be by August 27, 2012. The Developer is currently reviewing that schedule and is working with Hunt to reach an agreement. A resolution is expected by May 2011. A High Level Arena Summary Construction Schedule, dated July 16, 2010, has been provided for our review. The current schedule, prepared by Hunt, indicates that substantial completion is anticipated to be by August 12, 2012. The Developer is currently reviewing that schedule and is working with Hunt to resolve current schedule disputes. A resolution is expected over the next few months. Note that the substantial completion date has since been nudged back 15 days, and that the term "schedule disputes" is no longer used. A High Level Arena Summary Construction Schedule, dated July 16, 2010, has been provided for our review. The current schedule, prepared by Hunt, indicates that substantial completion is anticipated to be by August 12, 2012. The Developer is currently reviewing that schedule and there is a meeting anticipated for mid-December to resolve current schedule disputes. If the arena construction is ahead of schedule with the current number of employees, doesn't that also mean that the number of job-years for the whole project will be reduced? If they were hiring more employees to get the job done faster, it would maintain the total number of jobs created, but they don't seem to be doing that. I don't think we can measure job-years at this point. The estimates are based on construction of the *entire* project. But that's another argument for an Independent Compliance Monitor.